Despite hoping against the hope of someone other than Rafael Nadal winning the French Open, John McEnroe knows deep down that the Spaniard remains almost invincible with no competitor whatsoever. With Novak Djokovic now ousted, the only player to realistically challenge Nadal is Dominic Thiem. Two days ago, Djokovic was the only player left in the French Open who had overcome Nadal’s supremacy in Paris. And the manner in which the Serbian had outplayed the Fernando Verdasco in his previous round, Nadal would have taken notice. However, all that buildup was flushed down the gutter by an emerging Marco Cecchinato in the very next round. Though Djokovic looked like he had regained his lost aura in French Open at times, he also looked far from his best self throughout the tournament that made Cecchinato’s win believable to some extent. It is, however, the Italian’s next opponent that poses the real challenge to the La Decima winner. World No. 8 Dominic Thiem comes into the match on the back of a stunning quarter-final win over Nadal at the Madrid Open last month, which was followed by a title at the Lyon Open. The clinical Austrian has had a magnificent, albeit at times cagey campaign so far, which included him exacting his revenge over Alexander Zverev for his Madrid Open final loss in the last round clash. Post Nadal’s injury break, Thiem has been the only real challenger to the 16-time Grand Slam winner's dominance on the slowest surface with the Austrian beating the Spaniard in Rome in 2017 and the Madrid quarter-final match last month. However, Nadal has had his success against the 24-year-old as well beating him in the Monte Carlo quarter-final and a complete annihilation in last season's Roland Garros semi-final where the young star was bagled in the third set. 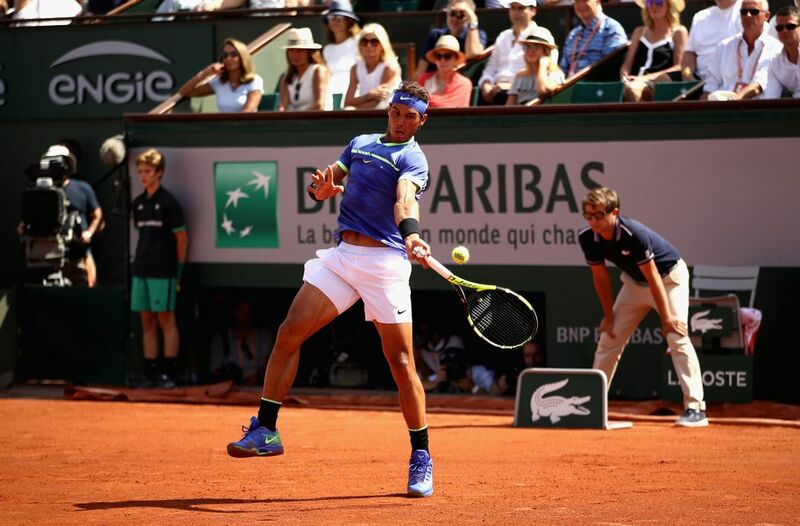 On the court that he has made his personal thrashing ground aka Philippe-Chatrier court, Nadal has been nothing short of the best this time as well. The 10-time French Open champion has dropped only one set in the entire tournament so far, which came against Argentina’s Diego Schwartzman on Wednesday before rain suspended the quarter-final match. Thiem would realistically be the first real contender Nadal could face and that too in the final and given the sparks of their recent battles, both would have enough homework to do before the extravaganza. Ahead of what appears to be a locked-in final, Thiem and his team would have already studied the King of Clay's performance in the tournament so far. A closer look at the first four matches that Nadal has won in the competition and one could observe his tremendous dominance over opponents in the points won from his first serve. In his second match against Italy’s Simone Bolelli which finished 6-4, 6-3, 7-6, Nadal won 74% of points from his first serve as compared to Bolelli’s lowly 56%. This kept the match in Nadal’s favour from the get-go despite Bolelli looking seemingly comfortable and sometimes even better than Nadal in winning points from rallies and at the net. Against Guido Pella in his third match where he won 6-2, 6-1, 6-1, we only saw Nadal getting stronger and stronger with his serves where he managed to win 85% of the service points from his first serve compared to Pella’s 66%, before finishing him at the net. However, although the chinks in Nadal’s armor are almost untraceable, Thiem would want to keep the Spaniard either away from the net or dominate him in the front-court. Nadal's comfort zone has only been challenged twice in the last four matches, once against Bolelli and another Maximilian Marterer - both in the deciding set. He won both of them 7-6 surely but the opponents were seen besting the king of clay at the net. Both Bolelli (5/8) and Marterer (5/8) won 62% of his net points compared to Nadal’s 50% in the third set. A defensive player by nature, Nadal hasn't been the best at the net, but neither is Thiem. Luckily, the Austrian has a short sample to study his exploits over Nadal, should they face off in the final. An aggressive baseline player by nature who excels in defending as well, Thiem relies more on his heavy forehand and surprisingly powerful backhand and consistently perfect high looping groundstrokes. Thiem’s ability to generate top-spin in his groundstrokes helps him attack and defend well at the same time, which has gone a long way in helping him to negate Nadal’s accurate serves over the last few clashes, unlike many of his clay opponents. His penetrating groundstrokes have also kept Nadal at the bay time and again, although Thiem has only used his weapons comprehensively and collectively on three of the last six occasions that they both have met on clay. The Austrian is known to finish off rallies with solid volleys after setting up his opponents with top-spin first and sometimes even on second serves, which are slow in nature but immensely looping forcing the opponents back. However, a source of worry for Thiem against Nadal would be his failure to execute winners at the net. This season at Roland Garros too, Thiem has almost always been the second best at net points. Ilya Ivashka, who lost 6-2, 6-4, 6-1 to Thiem, managed to win 10 of his 18 net points against Thiem’s four out of 10, while Kei Nishikori, in his hard-fought 6-2, 6-0, 5-7, 6-4 loss to the Austrian, saw himself winning 13 of his 18 net points as opposed to Thiem’s 10 off 17. While Matteo Berrettini could only equal Thiem at net points, the Austrian’s only success came against Stefano Tsitsipas where he looked way more calculative at the net winning 19 of the 22 points after he saw an initial fumble in the 6-2, 2-6, 6-4, 6-4 win. However, just when people thought Thiem had pulled himself out of the tailspin came an agile Zverev who despite losing the match (6-4, 6-2, 6-1) in straight sets had got the better of Theim at the net. Hence, a relentless Nadal, who would definitely be more agile and adamant with his unparalleled stamina, would look to exploit Thiem’s weakness time and again. Another important aspect, which Theim would be wary of, would be Court Philippe-Chatrier. While Rome saw very little area behind the baseline for Nadal to ply his trade as Theim was able to set him up properly, Madrid’s windy conditions in the altitude of around 2000 feet had helped Theim massively to go around Nadal. His fierce single-handed backhand and passing shots were just too much for Nadal to handle, who had later even credited the conditions for Thiem’s stunning win. “In Monte Carlo and Barcelona, you have the feeling that you are in control of the situation. Here, it's different. It takes you time to adapt to how the ball bounces and flies. It's not under control like the other two tournaments. Everything is a little bit more difficult," Nadal had said after the match. Thiem’s ability to see off long baseline rallies has been one of the biggest reasons for him winning seven of his nine ATP titles on clay. Over the years, he has managed to stun the likes of Nicolás Almagro, Stan Wawrinka and even Roger Federer on clay apart from Nadal. The youngster has also been credited for his good temperament and patience as reflected in his tie-break percentage, all of which will be challenged at the Chatrier. There’s a reason why the centre court at Roland Garros has been standing like a guardian looking over Nadal all these years. The vast 32-foot run-off behind the baseline makes the court the largest Grand Slam court worldwide and a defender’s paradise. To make it more dangerous, the slow high bouncing clay on the court makes the conditions impeccable for Nadal to grind his way out of any tough match. If that wasn’t enough, the planned roof that stands like a cover with a space of around one-and-a-half metres between the top of the building and the 11 wings, keep the humidity unchanged and conditions soothingly windy inside the court. With Nadal’s weakness seemingly non-existent in Roland Garros, Theim wouldn’t have to only work at his strengths, but also in reducing his flaws. 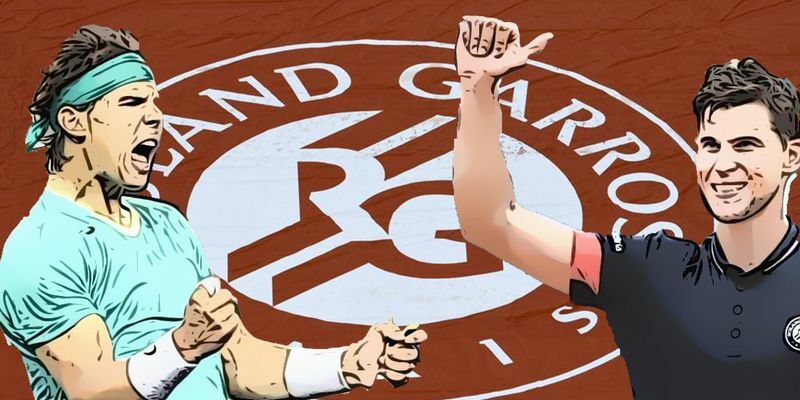 When they had both faced last time in the Roland Garros semi-final, Thiem was comprehensively beaten 6-3, 6-4, 6-0 with the Austrian’s return stats showing terrible figures (winning 29% in first serve and 24% in his second serve). However, Thiem would know that he has improved drastically since then and studying his wins in Rome and Madrid has discerned that only an aggressive approach would give a chance against Nadal. Nadal was mostly challenged by Schwartzman in the whole tournament who took the game to the Spaniard. Thiem had the same tactics in some of the previous games, where he picked on Nadal's returns very early standing closer to the baseline. Though it doesn't exactly is the key to beating Nadal, but the chances increase largely. However, the shrewd 32-year-old tennis ace knows what is at stake and has looked like a man on a mission so far, and with the conditions increasingly in his favour, Thiem would have to pull out something special. Join & Play NOW! Click here to download NostraGamus & get ₹40 Joining Bonus!